Our EPS attending physicians have been working alongside leadership and faculty members at University of Arizona’s College of Medicine – Phoenix to help teach and mentor future generations of healthcare providers. 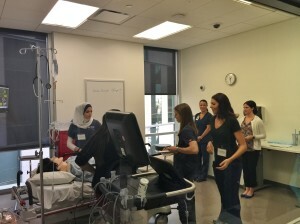 Medical students have the opportunity to use the latest, advanced medical technologies and high-fidelity patient simulators at UofA’s Center for Simulation and Innovation. 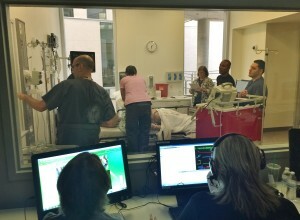 Simulation-based training provides learners with the unique opportunity to practice skills and enhance their decision-making processes in a safe, engaging environment. Working as a scribe himself while attending medical school at the University of Arizona, Dr. Mahmood Vahedian wished to share his unforgettable and inspiring experience as a scribe with other potential medical field candidates. After joining EPS, Dr. Vahedian initiated a scribe program with a pilot group of only 6 scribes. In less than a year, the program grew to over 40 scribes and now stands at about 100. The program allows pre-healthcare professionals, such as pre-med, pre-PA, pre-nursing, students to gain knowledge and experience of the medical field not taught in the classroom. EPS scribes currently work at four Banner locations in the metro Phoenix area: Banner University Medical Center – Phoenix, Banner Estrella Medical Center, Banner Desert Medical Center, and Banner Cardon’s Pediatric Center. Our scribe program affords pre-healthcare professionals with the opportunity to work alongside providers in a capacity that far exceeds any shadowing opportunity. They receive in-depth clinical exposure while honing time management skills, interpersonal skills, etc. 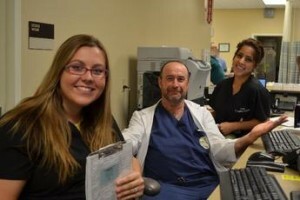 Our scribes are responsible for documenting the entire provider & patient counter including: patient’s history, physical exam, test results, consultations, etc. In turn, EPS providers are relieved of administrative tasks and are able to spend more time directly involved in patient care. Gorgeous scenery, chilly temps, and beautiful wildlife! EPS provider, Dr. Cheri Macy, was honored to serve as the ship physician for a 10 day expedition to Antarctica with a tourism travel group. Dr. Macy’s voyage was on a charter ship dedicated to raising breast cancer funds for an Australian charity. She was among other accomplished individuals, such as notable scientists, renowned polar experts, and even a world-famous Australian painter. 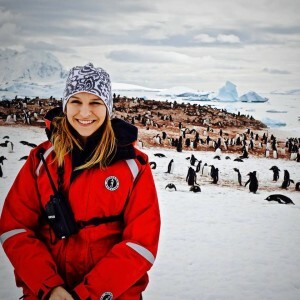 Together the group’s knowledge, accomplishments, and dedication to charity all help to keep Antarctica special. On a continent with no cities, hospitals, government, etc., Dr. Macy was proud to provide emergency medical care in such a remote area. 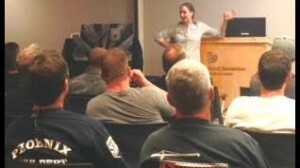 EPS physicians, Dr. Eric Cummins and Dr. Beth Ranney, were honored to participate in the 2nd Phoenix Fire Department’s Continuing Education Conference at Banner-University Medical Center Phoenix. The three day conference was very successful, bringing together approximately 240 local Phoenix Fire paramedics for education from EPS and BUMCP’s very own physicians and nurses. 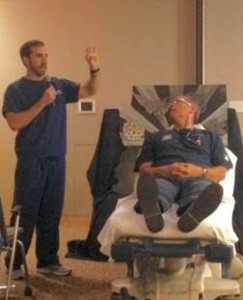 Dr. Cummins and Dr. Ranney presented demonstrations on Emergency Cardiology Management and had glowing reviews from the paramedics. The conferences also included talks on BUMCP future plans, Phoenix Fire Department updates, our LVAD program and device awareness, and a dedication of artwork designed by some of BUMCP’s ED and Trauma staff, which will hang in the new Emergency Department. EPS wishes to extend a special thank you to Sara Latham, RN Program Outreach Manager, for her organization of this wonderful Continuing Education Conference. We are proud to have such a strong partnership with EMS and local Law Enforcement in our community. 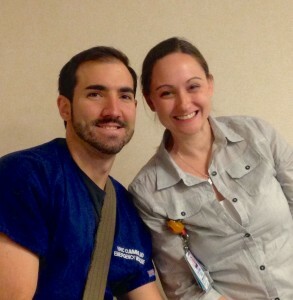 Jessica Monas, M.D., is proud to serve as a faculty member for the Emergency Medicine and Acute Care series. Currently in their 35th year, this series is a focused, evidence-based course designed to significantly advance a physician’s practice of medicine. 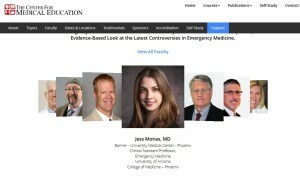 Dr. Monas has lectured and participated in panel discussions on key emergency medicine topics such as Diagnostic & Therapeutic Controversies, Important Recent EM Literature, etc. 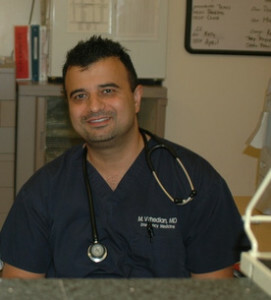 Additionally, Dr. Monas continues to contribute to academic Emergency Medicine as co-author of several textbook chapters, including “Antipsychotics” in Rosen’s Emergency Medicine, 9th Edition and “Acid-base Disorders” in Scientific American’s Emergency Medicine: https://www.deckerip.com/products/scientific-american-emergency-medicine-individuals/. EPS Board Member and long-time provider, Dr. Todd Clever, is proud to promote a pilot paramedicine program in Buckeye, AZ with the goal of not only reducing hospital readmission rates, but also enhancing the patient-provider connection. In January, Dr. Clever was featured on Boston’s NPR News Station and 91.5 KJZZ, a service of Rio Salado College. 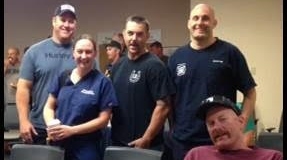 As part of a pilot paramedicine program, Buckeye Fire Dept members and paramedics make house calls for patients recently treated at Banner Estrella Medical Center, where Dr. Clever is the EMS Medical Director. Helping patients with issues like taking prescription medications correctly and monitoring vitals have reduced hospital readmission rates greatly at BEMC. Out of 131 patients, only 4 were readmitted within 30 days…just 1/6 of a local hospital’s readmission rate! The program is still in pilot-mode, but Dr. Todd Clever says the goal is to make it a permanent option for more Buckeye residents and continue to bridge the gap between hospital and patient. 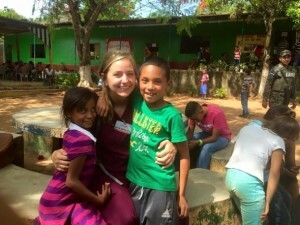 In May 2015, EPS Office Assistant and NEISS Data Coordinator, Devyn Michelotti, helped implement resource programs to an underprivileged community in rural Honduras through Arizona State University. Drs. 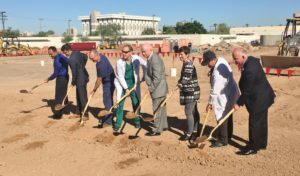 Moneesh Bhow, David Streitwieser, and Alan Molk were proud to help break ground on a brand new Emergency Department at Banner – University Medical Center Phoenix on October 2, 2015. The new ED will include 60 private exam rooms, a new trauma unit, MedLink and 40 observation beds and serve an additional 20,000 patients. The Emergency Department is scheduled to open in July 2017 with the new operating and observation rooms opening in March 2018. © Emergency Professional Services 2019.